Postiano, jewel of the Amalfi Coast. Drive the spectacularly cliff-hanging Amalfi Drive. Relax with the jet set in posh Positano. Discover the amazing marittime history of Amalfi. Listen to a concert in the villa gardens of Ravello. Shop for ceramics in Vietri sul Mare. The Amalfi Coast is one of Europe's great scenic wonders. The impossibly winding Amalfi Drive road that follows it high up on the cliffside—often cantilevered over empty space—is a marvel of engineering and one of the world's best white-knuckle thrill rides outside of an amusement park. This 50km (30 mile) stretch of crinkly coastline between Sorrento and Salerno offers breathtaking scenery as you make your torturous, winding way from one gorgeous sea cove into the next, some craggy inlets so sheer and deep they almost qualify as mini-fjords. High, tree-swathed cliffs on your left plunge tumultuously into the azure waters below you on the right, the inlets and headlands punctuated by scraps of beaches, terraced groves of giant lemons, and some of the most inviting, relaxing, and beautiful small towns in Italy. The bougainvillea-crowned and jasmine-scented villages of the Amalfi Coast range from pricey resort town to old-fashioned fishing hamlet. 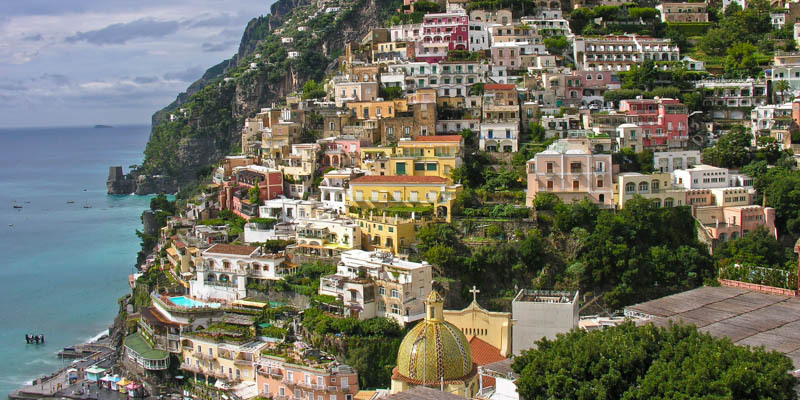 Among the some dozen communities strung along the coast is a trinity of required stops: posh Positano, historic Amalfi, and garden-filled Ravello. Just offshore (and accessible by ferries from any Amalfi Coast town, Sorrento, or Naples) lies the fabled island of Capri, a hedonistic getaway resort since the time of the Caesars.